( December 8, 2013, Colombo, Sri Lanka Guardian) Touching the bars of the cell within which the late Nelson Mandela, who passed away this week aged ninety five years, was imprisoned on Robben Island was an unforgettable experience some years ago. The claustrophobic spaces within which Mandiba, as he was known to his people, spent years unjustly confined by a racist white apartheid regime, spoke to his endurance and most of all, his incomparable humanity. Unsullied by this torment, he led his beloved country down the road of forgiveness and not hatred in a post-apartheid South Africa. This by itself is the most enduring lesson for Sri Lankans beset by religious and racial enmities even after active conflict has ceased in our land. There are other lessons as well. Anyone who has watched the film ‘Invictus’ cannot but be moved to tears by William Ernest Henley’s quiet reminder, as captured in the memorable performance of Morgan Freeman as Nelson Mandela; ‘I am the master of my fate. I am the captain of my soul.’ Forged in the crucible of intense political activism against one of the most brutal regimes that the world had known, human rights comprised a life-vision for Mandela, to be lived, to be experienced in its most vivid and glorious sense. This was a man who spurned stilted conversations on rights at dinner tables, at cocktail parties or within the stifling confines of a lecture room or a court room. And among pygmies disguised as men who use hypocritical bombast to mask terrible atrocities, who condemn populations to die by anonymous bombs dropped from the skies in much the same way that insects are killed with a blink of an eye, he held out a different cry of reconciliation, peace and non-violent persuasion. This rallying cry was as powerful against a white South Africa as it was when Mohandas Karamchand Gandhi articulated much the same sentiments against the British Raj. Unlike India amidst the terrible blood of partition however, South Africa emerged out of the apartheid era with dignity and courage. As the country advanced and as lesser men succeeded to the office of the President of South Africa, it was not as if the country did not have its share of problems. In particular, the economic situation of many black Africans continued to be dire. However, Mandela’s message endured. The post-apartheid constitutional structures that were put into place with its centre being an independent judiciary and a beautifully crafted Bill of Rights which worked effectively in practice, was testimony to this. These are matters that are relevant for the Sri Lankan people as they wrest with post-war problems of reconciliation. Talk of Truth and Reconciliation Commissions pervade the air. This was good for South Africa under Mandela’s enlightened leadership but is ill-suited for Sri Lanka with its post-war politically driven hostilities between ethnic communities, the deprivation of basic liberties and the tightening of authoritarianism. Instead, what Mandela taught should be personally internalized by Sri Lankans to seek public consensus against the autocracy and repression of government and to bring about changes that would make the seeking of truth and reconciliation an actual truth rather than mere glib phrases. In his inaugural address as South Africa’s first democratically elected President on May 10th 1994, he outlined his dreams for his country. His speech was just nine minutes and his declaration ‘let freedom reign’ rang exuberantly across the world. His reference to South Africa being ‘outlawed’ from the world must surely strike a chord of empathy with thinking Sri Lankans who helplessly witness the blackening of this country’s image in the community of nations due to actions of our politicians. To refer to the late Nelson Mandela as a ‘human rights icon’ is deplorably bad use of language. Mandela was far more than merely iconic. His spirit, his persona and his life was transcendental, symbolising one of the truly great men that we have known. 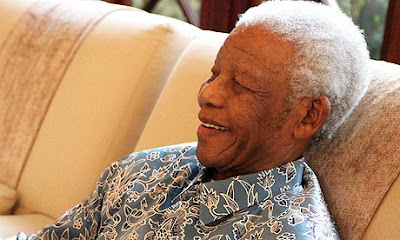 The force of his persona is not limited to the people of South Africa. Instead it is universal. As the world mourns his passing, this extraordinary life will certainly be celebrated in full.